Agree on the "solo" comment. Will definitely check out the '16 show today. We enjoy Unlimited Devotion too. Fun Dead cover band. sorry folks ive been off air. 17 minutes you tube i tried to point out those folks were very happy where they were and were enjoying it. as for mango dont feel bad. i did not like the monkeys or grand funk railroad. I could swear the GD started using teleprompters in the late 1980s... perhaps they gave 'em up cuz it didn't help?? 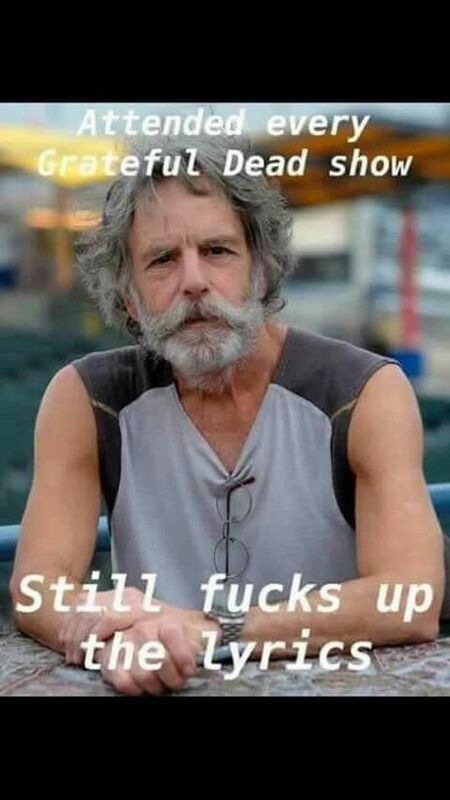 Haha , perhaps contrary to beliefs arising from this thread, I absolutely love the Grateful Dead. But this Bobby meme I find hilarious. There are only 5 topics on the active topics board right now. That's lower than I've ever seen I think. I didn't want to create a new topic because I am curious how low it can go. Tomorrow at 4:26 we will be down to 4. Even the Borum Forum topic fell off.